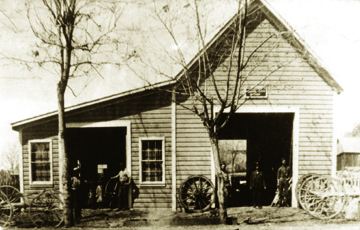 Amel Nelson's Wheelwright shop - 1890s?. 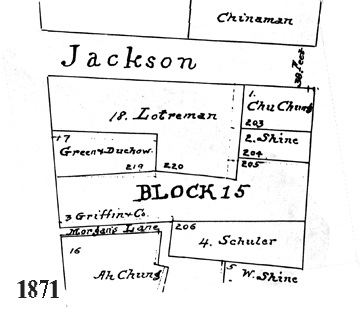 1853 Before this date the south part (Block 15-lot 2 & 3) were owned by DuBois, Jackson, Deaton and Nelson. 1871 The above map shows that Griffon & Co. own lot 3. 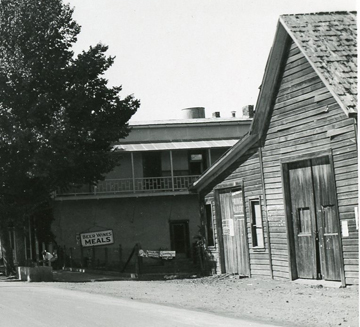 If the barn was built at this time it would have been on Lot 3 Main Street side (between Shine & Schuler). 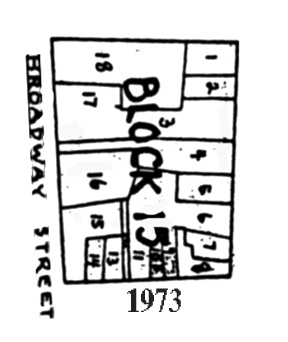 1880 June 3 - The census shows Amel Nelson as a wheekwright doing business at this location (Born in Columbia 22 May 1858). Papeete in front of barn - 1930. 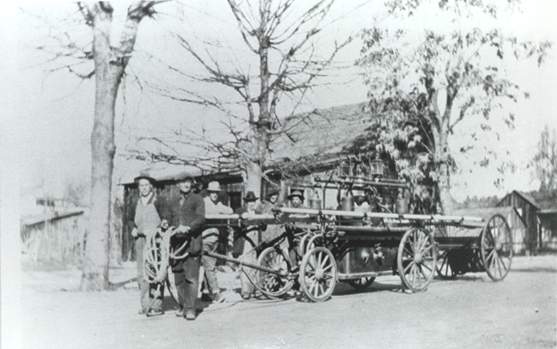 1930 Columbia's handpump, Papeete, has been wheeled out in front of the old barn. Note Franco barn and house to the far right. 1940 By this time the building might be slated for removal. Here it stands close to where the Gazebo will go. The trees are gone. The City Hotel is in the background and the porch on this north end is also going to be removed. NOTE: Just recently (June 2015) I was given the opportunity to scan images made by Brian Wolverton and discovered some interesting bits of mid 20th century history. If you have images that will enhance these pages please send them to my email or drop by and I'll scan them.